Now here’s something I never really thought about – I use shampoo and conditioners for color-treated hair but what about styling products made for color-treated hair? Thankfully the EUFORA line thought of this with their Color Locking System, which is a Sculpture Styling Glaze ($23/10.1oz), which has been featured on the site before, and an Illuminate Shine Mist ($20/4.2oz). Both of these help your color stay 30% longer then by using traditional styling products. These contain organic aloe vera gel and squalene, which helps lock the color into each strand. Both @ amazon.com . 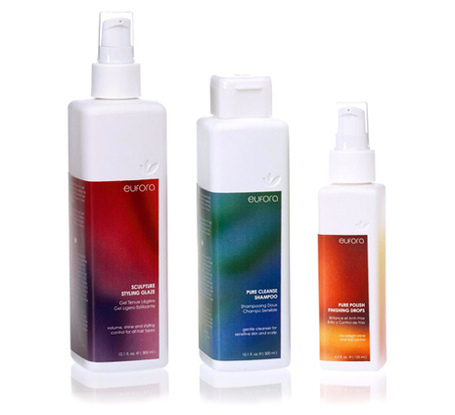 Sculpture Styling Glaze ($22.95/10.1oz) – used before blow-drying for control. Absolutely no flaking! Pure Cleanse Shampoo ($20.95/10.1oz) – no sulfates and is good at conquering dandruff. Pure Polish Finishing Drops ($28.95/4.2oz) – smoothes strands without leaving any greasy residue behind. And if you are still wary about using an aerosol hairspray, they claim to have the cleanest aerosol hairspray on the market with .001 environmental impact. All @ amazon.com or 800-638-3672.